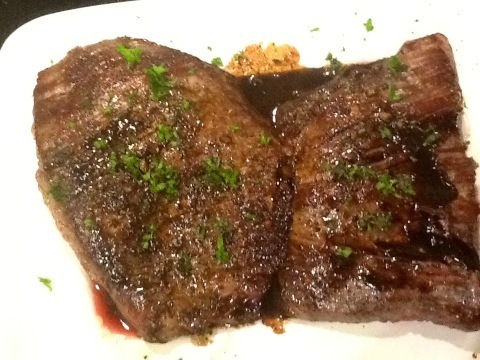 My plan last night was to cook one of Jewel’s favorites, Flat Iron Steak with Balsamic Reduction. This is a recipe that Jewel picked out a couple years ago to include in a holiday cookbook for her class. She handed me the cookbook without saying much about it, and I was flipping through recipes for macaroni and cheese and variations-on-a-cool-whip-theme desserts, when I saw this amazing-sounding steak recipe. 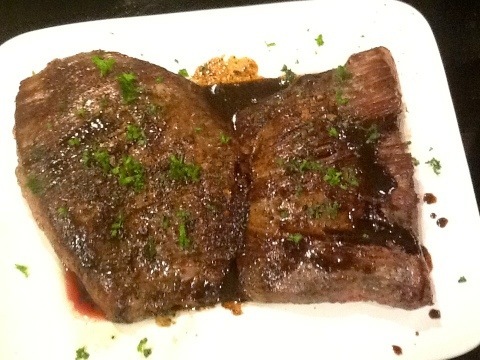 I asked Jewel about it (since I had never made this recipe before), and she said that she had browsed AllRecipes looking for a good steak recipe. She suggested we make it for Christmas Eve dinner, and that is our new tradition. However, this is an elegant but easy to prepare meal that is a shame to only serve once a year. I asked Jewel to help me prepare dinner since my back was acting up and I knew that she would be motivated to help ensure that this meal turned out. When she was getting out the salt and pepper, Jewel spied the curry powder I had made this past weekend. Do you see the Santa face in the cauliflower? Jewel did. 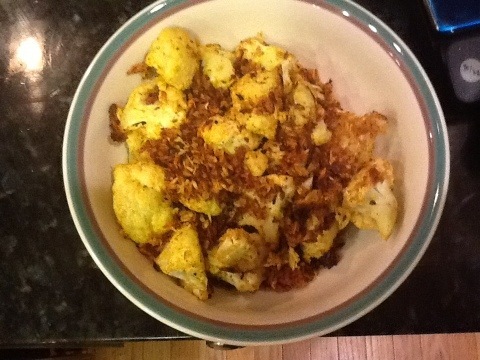 I cut up the cauliflower and separated the egg while Jewel greased the pan and mixed the spices together. Don’t throw that egg yolk away! That’s where all the nutrition in the egg is! I added the leftover yolk to the frittata I made this morning. 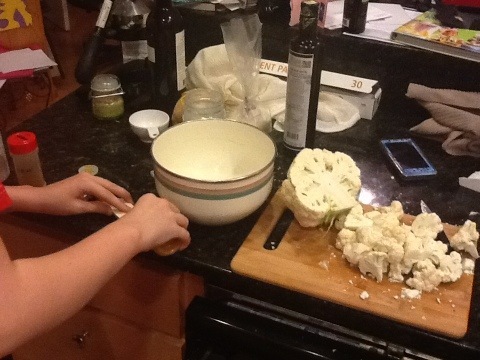 The cauliflower should be cut up into precisely one inch pieces. You know I had to bust out a ruler for this… Um, no. 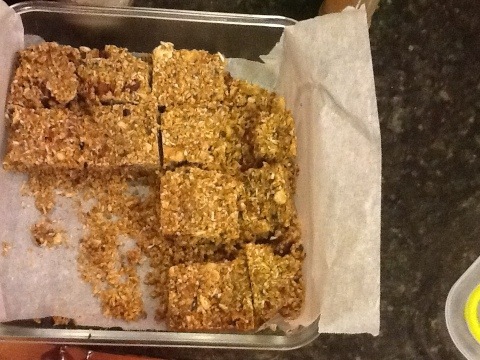 Then I remembered the Sweet Coconut Curry Granola Bars that Jewel hadn’t tried yet. So we had to take a quick snack break. I made these with just dates as the sweetener and they turned out fantastic. I also subbed sesame seeds for the sunflower seeds since that’s what I had. I used the last of the raisins and a mixture of dried cranberries and cherries for the balance. I also added cayenne because my old batch of curry powder was fairly mild. I was aiming for a Whole30-approved snack that wouldn’t trigger my sweet tooth, and I think I found it. However these bars themselves are so addictive that I had to have a few bites while writing this. Jewel also liked the bars very much, even though they were full of “bones”. More on that tomorrow. Right now we need to get back to making dinner. It’s easier to mix the spices together in a gallon ziplock bag, but it’s also more wasteful. I’m not a fan of disposable plastic. 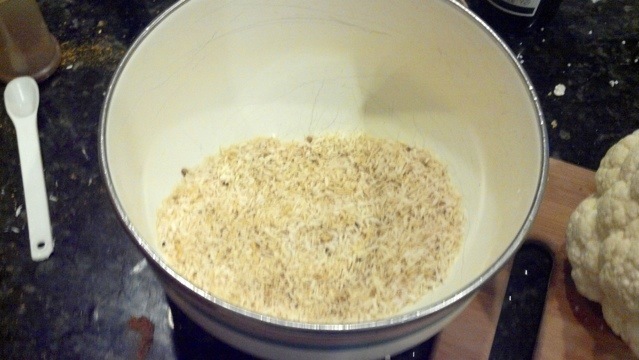 My mixing bowls have lids, but any large enough storage container would work. 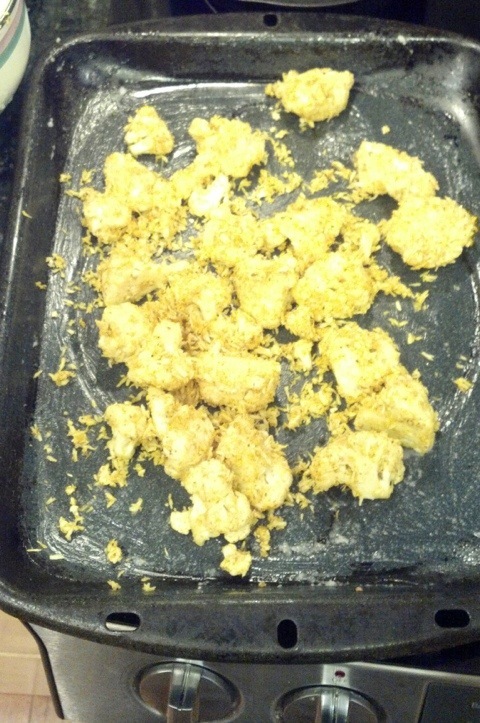 First I shook the egg white with the cauliflower, and then I added the spices to the cauliflower and shook them again. It helps to sing “shake, shake, shake the cauliflower”, but it’s not worth the $60 WordPress wants to charge me upload video to demonstrate. Coating the cauliflower thoroughly with the egg white and then the seasoning is a key step. Jewel tried to take a less blurry picture of me, but the iPad camera decided to quit working, probably out of fear. We switched to my phone, since actual cameras are too complicated. 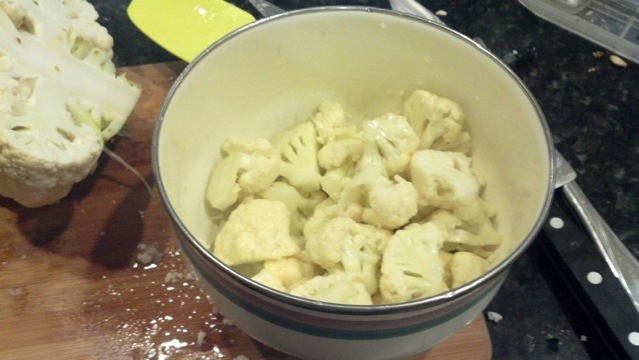 Dump the cauliflower gently onto the greased baking sheet. Bake for 15 min at 400, flip and bake for 10 more minutes. 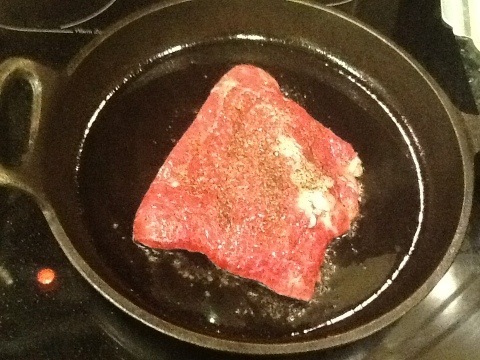 Cook the steaks for 3-4 min per side in ghee over med-high heat. 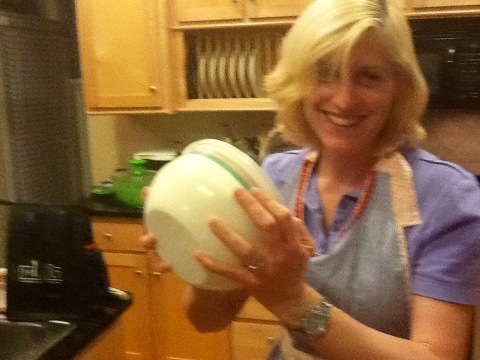 The recipe calls for butter, but butter shouldn’t be used at high temperatures. Ghee is clarified butter. Remove the steaks to a platter and keep warm. I love our warming drawer! Sauté a chopped clove of garlic for a minute, then add balsamic and reduce by half. Pour sauce over steak and sprinkle with chopped parsley so that it looks fancy. 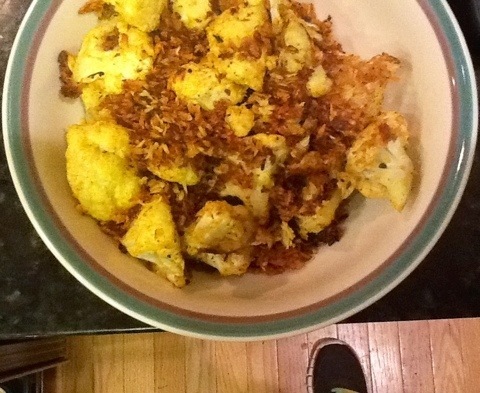 Place cauliflower in a bowl and top with the coconut that fell off so that it looks fancy too. 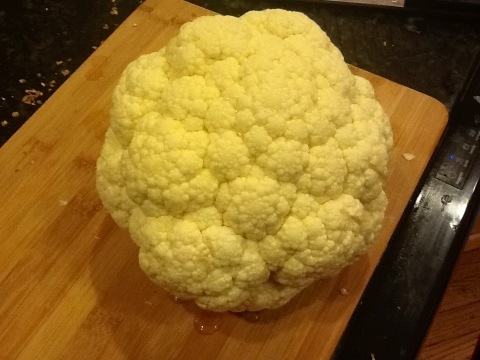 This is the coolest picture of the cauliflower because Jewel’s foot is in it. The cauliflower really tasted like a dish from an Indian restaurant. I think the fresh curry powder made a difference. I will double the recipe next time. Tom, Jewel and I all really liked it. We also served leftover portobello mushrooms, creamed spinach and steamed broccoli with this meal. Are you still wondering about the Santa face?